For over 25 years, Shreveport residents have relied on Dr. Charles Parker and Marshall Denture Clinic for innovative, competitively priced implant dentistry solutions. Backed by a top-notch team, Dr. Parker delivers personalized care to meet the unique needs of patients with missing teeth. We invite you to discover the life-changing benefits of implant-supported dentures and the advantages of choosing Dr. Parker as your restorative dentist. The doctor uses advanced techniques and life-like materials to create replacement teeth that are virtually indistinguishable from the real thing. Your smile is our top priority. Schedule an implant dentistry consultation and learn why your Shreveport neighbors trust Dr. Parker and our top-of-the-line technicians, lab, and network of specialists for full-service restorative care. Just think of us as your dedicated implant dentistry team. Dr. Parker and Marshall Denture Clinic – We give Shreveport customized care for lasting smiles. Call us at 903-935-6282 or toll free at 800-648-5491 and learn how dentures secured with dental implants can take your smile to new heights. 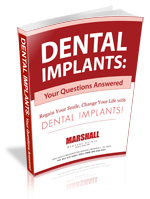 Click HERE for more information about Dental Implants!